For nearly 30 years, Magnusson Architecture and Planning (MAP) has worked hard to create affordable communities that people actually want to live in – not just containers for living. ArchNewsNow recently sat down with the senior leadership of MAP to talk about the firm, where it’s been, and where it’s headed. Magnus Magnusson, AIA, LEED AP, MAP’s founding principal, is a community development expert who has designed distinctive and award-winning projects throughout New York City and the Hudson Valley. Principal Christine Hunter, AIA, LEED AP BD+C, has worked in housing and neighborhood facility design, historic preservation, and sustainability for over 30 years. Fernando Villa, AIA, LEED AP BD+C, associate principal, has over two decades of experience in sustainable international design, historic preservation, adaptive re-use and residential projects. During his two decades at MAP, now-retired Principal Petr Stand, APA, focused on housing, educational facilities, medical facilities, and urban design. How has housing as a building type changed over the years? Magnus Magnusson: Housing is less segregated than it used to be. For example, Atlantic Terrace in Brooklyn has a resident population with four income tiers – from very affordable apartments to market-rate duplexes, so the lower-income tenants get the benefits of high-quality design that the market rate tenants enjoy. In addition, we’re also designing “hybrid” residential buildings that use urban land differently than before, because they incorporate functions like community-based health centers and schools. Fernando Villa: We’re also seeing new modes of housing that support aging in place, supportive and affordable housing for mixed-income residents, and residential buildings that include micro-units. Christine Hunter: More and more, sustainability is at the forefront of our design considerations. To achieve higher efficiency, we work closely with our engineers, starting at the beginning of a project. We make use of every part of the building by designing rooftops and set-backs to be functional and meet residents’ needs. They can provide additional outdoor space or even a place to grow vegetables! What inspires you about designing residential projects? Magnusson: It’s a more complex building type than many realize, and it’s the basic building block of urban development. Petr Stand: People need housing. Hunter: Residential projects can take longer to plan and design, but they often last longer than other project types, such as commercial buildings. In fact, I joined MAP because I wanted to do housing – it’s what drew me here. What are some of the greatest challenges you face? Villa: We often have to figure out how to do more with less: this is MAP’s mission, and it’s what inspired me to join the firm. It’s a challenge to work with limited budgets and multiple city agencies. We also have to figure out how to incorporate green features into our buildings. Hunter: As designers, we have to meet public agency regulations and building codes that are constantly being updated while also addressing specific project needs. For example, there are evolving federal, state, and local laws regarding handicapped accessibility, and considerable anxiety among architects over compliance. While accessibility is critically important in housing, the codes don’t differentiate among a wide spectrum of users and their limitations. For example, good design for a senior population needs to accommodate not only wheelchair users, but also those who are gradually becoming more frail. Concern over meeting the codes can sometimes eclipse other important considerations. What vision did you have for the firm when you founded it? Magnusson: When I started my practice in the mid-1980s, I knew that I wanted to make a difference in people’s lives through well-designed architecture. As many young architects do, initially I worked on a variety of small projects, including renovations and planning studies. Shortly after starting MAP, I had the opportunity to work with a small developer in the South Bronx who was pursuing a new affordable housing project through the NYC Housing Partnership program. This project showed me that community redevelopment has a tremendous impact on people’s lives and inspired me to continue designing housing that puts residents’ and community needs first. Were you able to find projects that met these criteria? Stand: When I joined the firm, there was a great need for housing and rebuilding in New York City. In 1992, I attended a conference focused on Bronx renewal issues, including the urban renewal plan that was then being considered for the Melrose neighborhood in the South Bronx. Almost immediately, I was asked to head the housing committee, and within weeks we got involved with Nos Quedamos (We Stay), a local community group. Together, we worked with the city to craft a new urban renewal plan and create a strategy to develop a more sustainable community than the one that was being proposed. 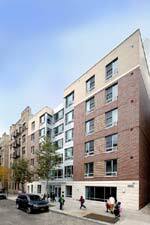 Magnusson: Our first two projects in Melrose Commons were an affordable multi-family, mixed-use housing development, La Puerta de Vitalidad, for a non-profit developer, and an affordable home-ownership townhouse development called Plaza de los Angeles for a Bronx-based builder/developer. After that, we did many more projects in Melrose, starting in the early 1990s. Even 20 years later, we are still very invested in the community and we’re still working there. What lessons did you learn from your work on Melrose Commons? Magnusson: Development should be community-based. All communities should have an architect and planner who is also their advocate. And some of the best projects have a non-profit partner on the team. Villa: We also know that Melrose has incredible potential to be an example for other cities in the United States, as well as other countries. Villa: We were able create a sustainable and comfortable residence for tenants of 1070 Anderson Avenue, which houses victims of domestic violence and also has affordable housing units. Although it was a difficult urban site, residents have daylight, and the building has an energy-efficient building envelope, a green roof, and native plants. Magnusson: Atlantic Terrace is an innovative mixed-use and mixed-income affordable housing project that got LEED Gold certification. It was an experiment that explored whether people of diverse income levels can successfully live together in the same building – and it shows that they can! Stand: We’ve even been able to carve out community spaces in buildings with tight budgets. At La Casa de Felicidad in the Bronx, we created lounge areas next to the elevator lobbies so people could hang out with their neighbors – just like they might pull up a chair in front their building to talk to people on the street. Hunter: We recently completed two mixed-use buildings along Main Street in the Village of Spring Valley, an older town in Rockland County. Both buildings incorporate street-level retail space with senior and family housing above. The village was an important partner along with our client, CPC Resources, in creating a “smart growth” project that contributes to downtown revitalization, while providing needed, high-quality affordable housing. Villa: We also just finished workforce housing at 22 Tarrytown Road in Westchester. Despite a lot of local opposition and financial problems, the project has been a big hit. Everyone is very proud of it. Is it hard to find clients? Magnusson: It can be. To overcome that, early on, we partnered with a small developer to help them get funding for a project, changing our fee structure during the approval process. So, essentially, we created a project rather than waiting for it to happen. Even now, we sometimes take a lead in development, not just design, by pulling together a team including financial resources, developers, and non-profits. We did this on the Atlantic Terrace project. More recently, we started a relationship with a non-profit in Newburgh, New York, and then partnered with a developer to create a mixed-use affordable project there. Stand: This is bottom-up, top-down planning. We’re community advocates who give non-profits and developers the tools to attract tenants. MAP has been in business for nearly 30 years. What are your goals for the firm as you look to the future? Stand: We are starting to do more planning work to help suburban communities. For example, we are finding that aging suburbs face the same problems we encountered in the Bronx 20 to 30 years ago. To overcome these issues, we are creating higher densities and transit-oriented development. Hunter: Since Superstorm Sandy, we’re also doing a lot of work to plan for resiliency, including in South Brooklyn, as part of New York City’s Build It Back program. Villa: While we continue to value a traditional design approach, our recent work embraces a modern aesthetic. We emphasize daylighting of interior spaces, and we use new materials and find innovative uses for traditional ones. Magnusson: In addition to bringing our community development work to new regions such as the Hudson Valley, I would like to nurture the next generation of architects to carry on the mission of our firm. Hunter: Our ideal client is someone who is an advocate for the project, and who cares about a building’s users and the surrounding neighborhood. Our goal is to collaborate with our clients and achieve their goals through good design. Stand: Non-profits are the best, because they’re not just about profit. They’re also interested in helping the community. What is your ideal project? Magnusson: An urban, mixed-use, mixed-income project that is sustainable and resilient – and of course a project in which we’re working for a client who cares about good architecture. Magnusson Architecture and Planning’s two new buildings along Main Street in the Village of Spring Valley, NY, include retail and senior and family housing above, and are contributing to a downtown revitalization. 22 Tarrytown Road in Greenburgh, NY, includes 28 units of workforce housing, and sustainable features such as a 6,000-square-foot green roof. With an Art Deco-inspired design, 1070 Anderson Avenue in the Bronx provides a safe residence for victims of domestic violence, as well as affordable housing units. Atlantic Terrace, across from Barclay's Center in Brooklyn, successfully mixes residents of diverse income levels in one building. This view from Third Avenue shows La Terraza, The Aurora, and La Puerta de Vitalidad, three of MAP's affordable buildings in the Melrose Commons Urban Renewal area in the Bronx, where the firm has worked for more than 20 years. A rendering showing a new mixed-use affordable project MAP designed in Newburgh, NY. 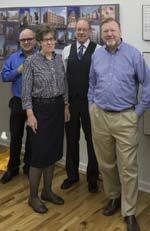 From left to right: Fernando Villa, Christine Hunter, Petr Stand, and Magnus Magnusson.